If you are able to catch the excellent Touch My Blood which is currently showing in the Playhouse for a few performances, you will be astounded as you walk into the Grand Foyer where the play is being presented. I wondered at the choice of The Grand Foyer over the Loft but I immediately saw why. Set and lighting designer Wilhelm Disbergen has brilliantly transformed this venue into a fascinating 180-degree performance space for this excellent production. The contrast between the Tudor-style of the venue and the set pieces depicting township homes backed by corrugated iron panels was fascinating. Another interesting – and unplanned feature – is that the ceiling of The Grand Foyer was originally constructed in such a way that tiny lights shine through like stars at night, which fits this setting very well. The pillars around the room have been covered with newspaper cuttings, referring to the author’s journalist career. The book, Touch My Blood is the autobiography of acclaimed and respected South African author, Fred Khumalo, whose writings over the years have covered major political and social changes in South Africa. Originally from Chesterville and having grown up in Hammarsdale outside Durban, he is a journalism graduate of Technikon Natal (now Durban University of Technology). He started making his name at school when he created a regular news bulletin, determined to highlight inequalities in the apartheid system. He is now editor of the Sunday Times' Insight & Opinion section and has contributed to major newspapers and magazines. He also hosted the SABC 2 public-debate television programme Encounters in 2008. The title of the book comes from a saying the teenage Khumalo would utter when he greeted his friends with a handshake. The three words can be interpreted in a number of ways, all of them signifying trust. The staged Touch My Blood forms part of this year’s Playhouse Company New Stages roster and is a product of The Playhouse Company Actors Studio incubation programme. Director Matjamela Motloung has adapted the play from Khumalo’s autobiography with the assistance of the Actors Studio Company. 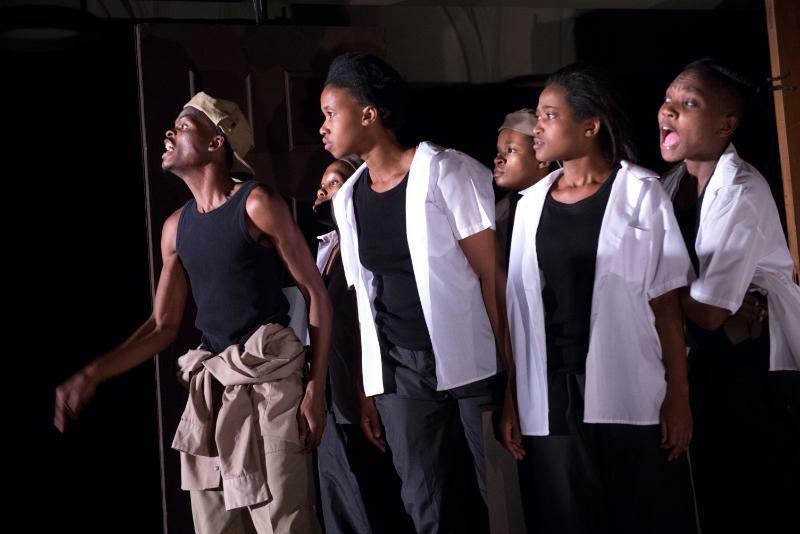 The cast features Anele Nele as Fred Khumalo who gives a strong and compelling performance. He is ably and efficiently supported by the rest of the Company: Phumelele Majola, Okuhle Danti, Ayanda Nyawo, Fezeka Shandu, Simphiwe Dladla and Thobani Gama. The setting is the 80s and the actors are mainly dressed in black vests or singlets and tights, adding the occasional prop to accentuate the character. The narration is mainly in Khumalo’s “voice” but Motloung has skilfully styled the action to give all performers a chance to shine. I was impressed at the range of credible characters and movement ability. At first, I was a little confused (unfortunately, I lost a lot of the content in the isiZulu sections) as to who was who, until I worked out that anyone wearing the same distinctive cap that Anele Nele was wearing, was continuing the author’s voice. The production is just under two hours long but the action keeps the audience riveted. It is also an extremely valuable educational vehicle for both young and old who are not familiar with the kind of existence and challenges that Khumalo had to face during his early life. We also meet some of the personalities - some good, some bad - that influenced him. Make no mistake, this isn’t an academic presentation but a powerful theatrical piece full of strong drama, much humour and some lovely scenes of pathos.